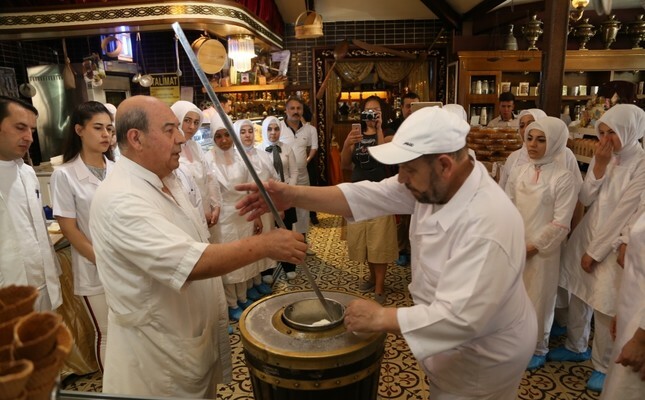 Maraş ice cream master Mehmet Sait Kanbur (L) teaches his pupils the finer details of how to make perfect ice cream. At a young age, Mehmet Sait Kanbur took over his father and grandfather's small Maraş ice cream stand. From humble beginnings, Kanbur has evolved from a small mom-and-pop shop into a world brand that now produces 100 varieties. Today, the 70-year-old works 19 hours a day both as a master and a trainer for those who will be entrusted with this profession in the future. Taking over this profession from his grandfather Mehmet and his father Yaşar, Kanbur took the first steps of this adventure many years ago in a 25-square-meter shop. Yaşar told his two youngest sons, "You will know your big brother as your father after I go." Yaşar Ice Cream was founded in 1962 under the leadership of big brother Kanbur with the support of his younger brothers Atilla and Erdal, laying the first foundations of the now famous "Mado." Kanbur, known for his hard work and striving to bring the "flag of ice cream" to new heights, is also noteworthy for his hygiene, work diligence and discipline. He is a hard-worker, starting the day early in the morning and working about 19 hours until 2 a.m. He frequently visits factories during the day. He directs the process for better production - sometimes by opening baklava dough and sometimes by checking the consistency of the ice cream. Kanbur supports his employees at every step. Kanbur is one of the opinion leaders of Kahramanmaraş. He is called "father" or "master" by many. He grazes his own goats and grows different orchids in a farm to produce ice cream from natural raw materials. He also does not neglect visiting Mado branches, which he has turned into a world brand, in different countries. Kanbur, as known for his humanity as his mastery, supports students with a scholarship, education and health, helping the needy in the meantime. nents in more than 100 varieties. In a statement to Anadolu Agency (AA), Mehmet Sait Kanbur said they carry on the family inheritance and that try to raise people who will carry it forward. Kanbur added that he is still trying to work as a master, stressing that he was born into ice cream and that a craftsman should be born into the work he performs. "I was born into ice cream, my grandfather and father's profession since Ottoman times. I said ice cream is my mother and father. As they were teaching me something, they said, 'My son, you wear gold bracelets on your wrists, and you can spend it everywhere.' This is what they taught us, and we carried this lesson on as well, but people don't want to be masters but to imitate them," Kanbur added. "They think selling cheap products is mastery. This is not right. You will take someone as example, and you will be a model. You are going to be a model from the people you take as models. So, you need to put a stone on it. If you are going to build a castle, if your ancestors gave you a 10-stair castle, you will put 10 more so that this castle will rise. Art is such a thing." "Not every ice cream is ice cream," Kanbur said, explaining that they created a world brand. "Today, we have stores in 27 countries. We are keeping the country's flag flying in 27 countries. This is a matter of vision. The master does not only do the job but directs it and carries his flag to different places. That is why mastery cannot be described, but can only be experienced. The master is trained next to another master. I always say, 'I am not an ice cream maker, I am ice cream'." Kanbur said they started with vanilla ice cream and went on to produce more than 100 varieties, noting that they diversified according to the culture of each country and that they have not been criticized for anything they have done so far. never thought about this business economically, but we think of it as a flag. We have taken this flag and fight so that it does not come down. We are still on the job, raising students. I still work as a trainer. We set out to make Kahramanmaraş a world brand, and today we made it so," Kanbur said. "The first thing that comes to mind when you say Maraş is ice cream. We turned a national, indigenous ice cream into a world brand. Others are trying to use our name, imitating and copying us. Every ice cream made in Maraş is not the same. Wheat from each soil is not the same either. Both the seeds and soil are important. The trainer is also important because training is something entirely different. We have one goal. We do not have another commercial point of view." Kanbur said that they try to teach the job to the children and members of the family, the people in the streets and the residents of Kahramanmaraş. "I do not allow imitation. Imitation means cheap. Do the right thing, make good quality and sell it right. You will lower yourself when you lower quality. When you raise that quality, it means you are all rising together," he underlined. Pointing to the importance of the teacher and master, Kanbur said being wealthy and having authority is something, while being a master is another. "We always put our mastery in the foreground. We are trying to teach people something. You will be on your job. You will do it yourself. You will cook your own bread so that you can be a model. We are trying to be a model," he concluded.